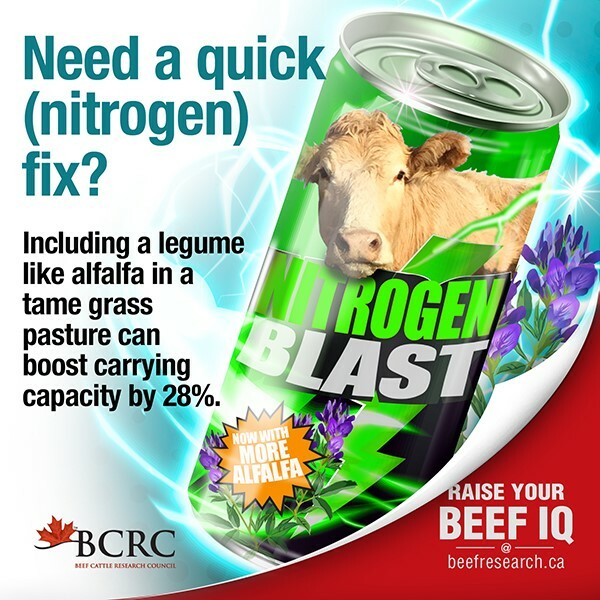 To show your support for Canadian beef research and innovation, right click on any of the following images and click “Save image as", then print or share online. share positive messages about Canadian beef production. Producing more with less for the world market. Visit www.beefresearch.ca for research news and science-based production advice. Better water = bigger calves. Visit www.beefresearch.ca for more science-based production advice. Less complaining. More gaining. Learn more about low-stress weaning techniques at http://www.beefresearch.ca/research-topic.cfm/weaning-65. Have an idea for another Raise Your Beef IQ image? We'd love to hear it! Email us at info@beefresearch.ca. Flip through your favorite industry publication and you’re bound to find stories on the latest release of AMR reports by influential organizations, regulatory moves by the Federal government to restrict the use of various antimicrobial drugs, announcements by grocery and restaurant chains to source meat produced with particular practices, or articles that encourage producers and industry groups to be transparent about why and how antimicrobials are used on farms. AMR is a real threat. If antimicrobials become less effective, then human health and animal welfare will suffer. AMR is a natural and very complex phenomenon, but improper use of antibiotics favors the development of AMR. AMU is necessary in beef production, and prudent AMU will slow the development of AMR. To learn science-based facts about Canadian beef producers’ impacts and responsibilities related to AMR and to find an excellent short new video, visit www.beefresearch.ca/AMR and talk to a veterinarian. The webpage includes a list of tips on how to avoid illness in cattle to reduce the need to use antimicrobials, and how to responsibly treat cattle when antimicrobial use is necessary. We know that not every animal going through the packer’s doors is ideal. Some animals will have horns that need to be cut off, or extra mud on the hide that slows down the processing line. Some carcasses will have too much fat cover, be bruised, or have lesions where injections were given, all of which require manual trimming. The more work needed to prepare a carcass for the cooler, the more we cut into our profits. And despite our best intentions, some fed cattle carcasses will grade poorly, maybe even as a dark cutter, and be discounted substantially. Imagine if we knew how often each of those problems occurred and how costly each of them is. With that information, we as an industry could work to reduce them, starting with the highest priority. We could also check over time to see if our efforts were working. That’s what the National Beef Quality Audit (NBQA) does. The Beef Cattle Research Council is proud to present an engaging video which highlights the results of the latest audit. You’ll see that Canadian beef producers have a lot to be proud of – significant improvements have been made in a number of areas since the previous audit. But there’s one area the industry is losing ground on.